Kansas Day is almost here, and I’ve got an inspiring way to celebrate! 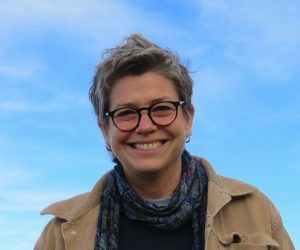 A new book is out which pays tribute to the Kansans who are advocating for lesbian, gay, bisexual and transgender civil rights. 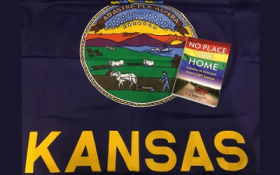 In No Place Like Home: Lessons in Activism from LGBT Kansasopens a new window, author C.J. Janovy shares the recent compelling stories of the leaders committed to making Kansas a safer place with legal protections from bigotry. Everyone who supports social justice will learn powerful models for continued advocacy. Janovy is a veteran journalist, including ten years working for The Pitch and is now the Arts Reporter at KCUR; this is her first book. I asked her why she decided to focus on Kansas rather than the whole region. Focusing on Kansas rather than the whole region was…where I knew there was a specific story… In 2013, when the US Supreme Court came out with its Windsor and Perry decisions, creating such an uneven legal landscape around the country [Kansas and many other states still banned gay marriage], Kansas was an especially interesting place to think about LGBT equality/advocacy/politics because of Westboro, which is known internationally as a place in Kansas (except when other writers mistakenly refer to it as in Florida, which I’ve seen). Finally, Kansas has a reputation. 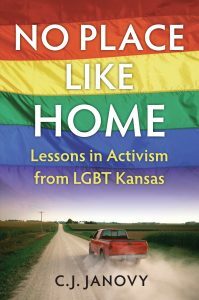 I knew an exploration of LGBT activism in Kansas would refute some of the stereotype, which made it fun and fertile territory to write in and about. Living in the middle of the country often means being neglected by national journalists who emphasize faraway metropolises of more familiar activism in places like New York and California. 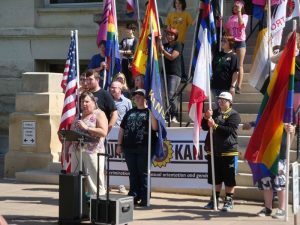 Lawrencians have a reputation for making our town a safe-liberal bubble inside a politically conservative state; we enacted protections from discrimination in employment, housing and public accommodations before most Kansas cities. The examples in No Place Like Home champion Kansas pride and personalities from rural locals like Trego County and the tiny town of Meade to Manhattan, Salina, Hutchinson, Topeka, Lawrence, Wichita, and everywhere that citizens are taking personal risks to ensure this middle ground is welcoming to a wider rainbow-range of people. Janovy vividly describes a 2014 gay pride rally in Wichita. This empowering moment punctuated ten days of pride events. The electrifying energy of the event she describes is depicted in the photo—provided by the author. At the podium is intrepid transgender heroine Stephanie Mott. Nine years after the marriage amendment defeat, on a warm, sunny Sunday, a dozen teenagers wearing T-shirts and cutoffs stood in a formation rising up the stone steps of Wichita’s old Sedgwick County Courthouse, a relic of prairie Renaissance architecture circa 1888… On the sidewalk in front of them, and spread out under shady trees, several hundred people had gathered for the annual gay pride rally. Meet author C.J. Janovy and several of the heroines and heroes featured in her book at the library on Monday, January 29—an apropos celebration for Kansas Day! My thanks to the University Press of Kansas for providing a proof copy of this book. -Shirley Braunlich is a Readers’ Services Assistant at Lawrence Public Library.